Russian Public Television planned to be funded by the public, but a lack of interest from ordinary Russians may leave it in government hands. 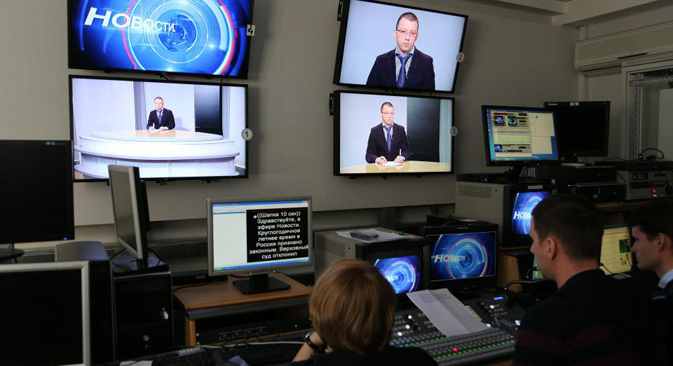 Russian Public Television is set to launch in the middle of May. The original plan was to fund the channel using donations from ordinary Russians, but the lack of interest (and, therefore, donations) forced the government to take on the financing of this social project. The initiative for a new public television channel was put forward in 2012 by then President, Dmitry Medvedev. Initially, Russian Public Television was expected to raise money through so-called target capital, which would be sufficient to provide for its activities as an autonomous non-profit organization. However, experts from the Russian Ministry of Communications and Mass Media have calculated that some 30–100 billion rubles (about $1–3.3 billion) were required to ensure the competitiveness of the projected television network. The amount would take years to collect in voluntary contributions and as a result, the authorities have outlined plans to allocate around 1.5 billion rubles ($60 million) annually to see the project through. The social advertising procured by various government ministries and departments will constitute another source of income for the new network. Several countries already employ systems whereby television and radio broadcasts are partially subsidized by their audiences. For example, U.S.-based National Public Radio (NPR) may serve as the role model of a public media outlet, as 39 percent of its operating costs are covered by its listeners. However, NPR is a fund-raising benchmark that relies on the audience that has been taught to play by these rules for decades. Another example is the BBC, the first public television network in the world. The British broadcaster is funded by TV license fees, which are more or less a tax charged on television owners. The resulting earnings are funneled into developing public media. In Russia, though, such funding mechanisms do not exist, as it is not stipulated in the law. Since Russian Public Television will be completely financed by the government, media professionals wonder if it will be any different from the existing government mouthpieces. “The impetus for the creation of public television did not come from the people. It is a government project,” believes Andrei Reut, Deputy Editor-in-Chief at the RBC business news channel. “The government pays the piper, so the government calls the tune. Given the channel is heavily subsidized, it may take root in its market niche, which is, most probably, the niche of another government television network,” Reut predicts. According to the existing plans, Russian Public Television will broadcast around the clock in the networks of several cable providers and will focus on science education programs, documentaries and reports on developments outside the Russian capital. No advertising or entertainment content is foreseen. “This is exactly what Russian television lacks – a smart, independent and socially relevant channel reflecting the interests of society and refraining from the criminal agenda and vulgar reality shows that drive ratings up,” Reut said.